The most virtuous nation in the world is to bring a second resolution against Sri Lanka for human rights violations at the Geneva sessions in March 2013. Sri Lanka however is yet to learn lessons from the principle of “once bitten twice shy” and so our external affairs ministry is shamelessly lobbying once more for India’s support. India is caught in a catch 22 situation brought about by its own machinations. India’s predicament vis a vis the US sponsored resolution is rather precarious. A vote in support of Sri Lanka would mean that the US would pull all its underground triggers in India to fast forward the separation of Tamil Nadu. The foundations have already been set. On the other hand, a vote against Sri Lanka would mean practically handing over Sri Lanka on a golden platter to China waiting with open arms. No superpower would like to find itself in such a compromising situation. The US Resolution is clearly with the complete tacit approval of the Indian South Block thinking it would help force Sri Lanka to implement the 13amendment though US agenda realistically lies elsewhere. Why would the US, India’s so called strategic alliance partner wish to bring a Resolution against Sri Lanka that would leave India in a very uncomfortable position? India’s stakes in Sri Lanka are a threat to the Western plan to ultimately balkanize India. The West has been subtly manipulating India’s strong chief ministers and other power centers. Using the Resolution, the US creates a dent to India’s strategic objective to Indianize Sri Lanka. It is nothing that India would like to walk away from. Using the Tamil Nadu factor and the canard of “India’s concern for Sri Lankan Tamils”, India has subtly managed to buy over Sri Lankan media, politicians, public sector officers and even corporate sector officers of various rank and file thus grasping a disproportionate level of clout than India actually possesses though these do not translate to having any effect at core strategic policy making level within Sri Lanka. Indian personnel are today holding key positions in the private sector in Sri Lanka and Sri Lanka’s lucrative tourism industry is also gradually being controlled by Indians. Many of Sri Lanka’s key export crop factories too are now in their possession. 1. India continues to insist on the full implementation of the 13a (signed under duress in 1987) to set the grounds to divide Sri Lanka in to 2 (a re-merged north and east ruled under an India friendly Sri Lankan Tamil political party – giving India full control of Sri Lanka’s strategic assets including Trincomalee port. 2. Indian gunboat diplomacy matched by Sri Lankan appeasing attitude has ensured India’s control of projects that include Trincomalee Port, Kankasanthurai, Palali airbase to ensure Indian presence. India is well placed to monitor Sri Lanka’s air and naval operations while its ground intelligence incites protests to remove naval presence in Mullikulam and gain entry to places like Keppapilau through Indian housing schemes. 3. India’s control of Sri Lanka’s power and energy sector (Cairn India and NIOC) through projects like Sampur power plant, undersea electricity line linking India and Sri Lanka clearly spells India’s total control of Sri Lanka in time to come. It is with such a powerful leverage that India has succeeded to even remove the efficient Minister who stood in India’s way to clasp that power. A superpower like India is being bribed into acquiescence to support Sri Lanka in Geneva for a detrimental project like Sampur. 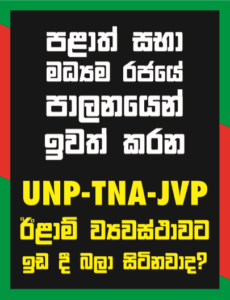 How knowledgeable is the new puppet appointee in vesting control of Sri Lanka’s strategic points and not allowing key stakes to be outsourced to a nation that has worked towards destabilizing Sri Lanka at every turn. 4. With little or no objections from Sri Lanka’s external affairs ministry, India is able to not only hold a stake in Sri Lanka’s oil exploration but can dictate who Sri Lanka can invite. Yet, we are still to hear from India whether there is oil deposits or not except for news releases on and off just to keep the suspense! What nation would allow such a key sector to fall into the hands of a nation with a track record of destabilizing? 5. India after pulling every trick in the book to implement the CEPA trade agreement and with stiff resistance it has come up with several trade agreements which once consolidated would effectively mean the CEPA is implemented. Sri Lanka is looking at a situation where all skilled/semi-skilled labor would go to Indians leaving Sri Lankans to function as labourers and unskilled workers ONLY! 6. One of the lowest manipulations has been to use Sri Lanka in advancing India’s look East policy tying the Buddhist world to challenge China’s increasing ties in Asia. While India has no right to use Buddhism as a soft power tool, Sri Lanka is making another faux pax facilitating India’s cunning because India is using Sri Lanka’s credibility in the “Buddhist World” to advance its own interests only. 7. India’s entry into the electronic and information technology arena has ensured its presence in the key gateways that would ensure its intelligence are able to monitor and manipulate not only Sri Lanka but the entire South Asian neighbors. China on the other hand suddenly emerged as a catalyst to complete what was always described an “unwinnable war”. Without a doubt the credit for Sri Lanka’s victory over terrorism goes to China, Pakistan and Russia whereas India with the exception of 2 obsolete malfunctioning radars did not provide even a bullet to Sri Lanka though it positioned itself over media as having played a key role. It goes without saying that Sri Lanka constructively engaged the entire international community including UN representatives like Nambiar and India were well aware of the situation making all of them equally culpable in any charges that are being framed through this Resolution. We also recall how Sri Lanka had to send delegation after delegation just to keep “India appraised” when in reality India was looking towards delaying the inevitable. Sri Lanka was forced to delay the final victory in May 2009 at the cost of life to Tamil civilians and soldiers at the hands of the LTTE so that India’s Congress could win the Tamil Nadu elections in early May 2009. A good comparison of the two powerhouses would certainly give China more than an edge because China’s approach is minus covert action. It adopts a hands-off internal affairs policy, development assistance has a “real” quantum value and visibility, partnerships once forged ensures a rock solid unstinting diplomatic support base at all international multilateral forums – its “win-win” packages are nothing that India or the West can match. India’s record on the other hand is too dismal to even relate on all or any of these spheres. Nevertheless, it goes without saying that Sri Lanka’s suffering over 3 decades was primarily as a result of India’s destabilizing policy and not a single world leader or human rights organization has cared to take India to task for sponsoring LTTE terrorism in the initial stages though it is still not too late. Yet, the world is always quick to find fault with countries such as China or Sri Lanka for their human right records. America’s human rights record is nothing but abysmal. America’s ties to groups that support terrorism inclusive of the LTTE front organizations, Al Qaeda in Syria, the Muslim Brotherhood etc show very little diplomatic sincerity or a higher moral ground to warrant the self-appointment as champion against global terrorism. The US Resolution forcing India to vote against Sri Lanka would mean a loss for India and not Sri Lanka and would leave the Rajapakse “regime” further solidifying its domestic position and cementing its friendship with China even further. Neo-liberal world politics today is about pressurizing third world leaders using guillotine trials for violations of human rights and crimes against humanity until they agree to Western dictates of regime change and handing over strategic assets. Those that refuse ironically help to expand China’s footprint over Asia. For Sri Lankans who have been standing up to these dictates the US Resolution is really a blessing in disguise as it will unify, genuinely reconcile and strengthen the nation even further….